Today I leave for our seminary trip to Vietnam and Cambodia (calling it ‘Nambodia). What can I say but I’m really excited. About halfway through my packing, I came to the realization that I was not feeling the usual anxiety. Initially I thought, “I must be maturing and getting used to traveling.” Then it hit me – I didn’t feel the anxiety because I’m not leading a group of 20 teenagers! Ha, ha, I do love our students and mission trips but I did also like the idea of not being in charge. A quick overview: Each year the graduating class of our seminary goes on an international mission experience (IME Trip). Among its many objectives is to see how the church interacts with the culture. This year we have the unique experience of interacting with university students. Western evangelicals are a rarity in that part of the world; in fact, the percentage of Protestants makes up less than 1 percent of its total population of 80 million people. In addition to interactions with fellow students, we will be taking in numerous sights of Vietnamese and Cambodian culture, touring historic sights in Vietnam, the Killing Fields memorial in Cambodia, and the Angkor Watt Temple. Though I will miss my family terribly, I am really excited. Like most people, I enjoy traveling and gain so much from the experience. I believe firmly that there are certain lessons that you can only learn once outside your zip code. Most likely, I will enjoy this trip but at the same time, I have been trying to prepare my heart in these specific ways. First I hope it is humble and broken before God. Second, this is the last Hoorah! for Cohort 10. It is no exaggeration when I say that I am going to miss these dear friends. It won’t be complete though, we will be missing two of our brothers – KJ & Evan due to extenuating circumstances (like a birth of a new boy!!!). Third, I want to listen: to the students, to the locals, to my friends as they listen, and to the Lord through whispers and proclamations. There will be moments of beauty, brilliance, disappointment, shock (like when visiting the war museums, have you see the pictures of babies who have been affected by Agent Orange?) and among others – hope. There’s a couple other hopes and thoughts that I will keep to myself for now. But I imagine that I will do a lot of reflecting on family life (being a husband, a father, son, brother, friend, etc.). Also, I will be reading more NT Wright for my independent study (who better?). Anyway, I am really grateful that Biblical Seminary and the Eastern Mennonite Conference answered the invitation from the Vietnamese Government to interact with a group of their university students and I really grateful to the Vietnamese officials who are welcoming us. If you don’t mind please keep me and our team and our families in prayer. Grateful for all our support in finances and intercession. Grace and peace. It could have something to do with leaving for our trip to Vietnam/Cambodia, it could also have to do with meeting with our life insurance agent, but I’ve been thinking about our mortality a bit lately. To be honest, it has not been that depressing, probably because no one I am thinking about died. Here’s some more of the context. For the past 3 years I have been commuting two hours each Tuesday night to Biblical Seminary (which is near Philadelphia). I have always enjoyed that drive. My mind stimulated from the class discussion, conversations with fellow cohorters pinballing around in my head, thinking about the next day’s youth group lesson and some other spiritual moments have led me to think that I am going to miss this time. However, in the back of my mind, there was always a concern for that late night drive. And as my last night of class approached, I could not shake the paranoia or the irony of crashing on the very last night of class. It reminded me of a song about a solider that was going to return home to his fiance but had been killed on the last day of fighting. It was raining as I headed to school that afternoon. Listening to music, podcasts, and making phone calls has been the norm and it was during the Relevant Podcast that this Acura cut me off. He did not realize that traffic was stopping in front of us so almost immediately, he braked. I swerved to the lane he came from (without a chance to check my blind spot) to avoid him. Pennsylvania drivers. Returning home there was a similar moment. Caffeinated, listening to the White Stripes, and feeling pretty alert, a truck up ahead in a slower lane swerved and applied his breaks – a deer emerged and was debating whether or not to cross in front of me. I applied the breaks and waited to see what the deer would do before swerving. Clearly he too was from Pennsvlvania because he could not make up his mind. When he finally did, he decided to cross over to the center median and so I swerved to the right and kept an eye for his fellow cohorters. I prayerfully pulled into my driveway (I get very religious when I almost wreck), collected my things, and got inside – all was well. Two days later, news was released that Bono was injured in a rehearsal in Germany. Recovering from his emergency spinal surgery that fellow U2 fans dodged a bullet. I know, I know, I heard and read all the jokes regarding it was ego that led to his back giving out and though the surgery to his spine was successful, they were unable to remove his sunglasses. To you I speak this curse to you – May your iPod only play American Idol playlists. Sorry, sometimes my anger gets the best of me. This post was considerably longer because of all the Bono thoughts. I’ll save them for another day but for a few days, and as dramatic as this sounds, it got me thinking a lot about Bono. Then later that week, a middle-aged man in our church was rushed into emergency surgery after collapsing earlier at work. It turned out that three major arteries in his heart were blocked and it was an incredible story that nothing worse happened. It was after his news and meeting with our life insurance agent that I had a hard time not thinking about death. It could have been a really bad week for me, my church, even U2 fans, and many others. I know for many people, it probably still was a bad week. Someone did not avoid the car in front of them or the deer that crossed their lane late at night. For some, emergency surgery was not successful and some are speaking to their life insurance agents for different reasons. Indeed, this is part of the tragedy of the world we live in but I have always been grateful for the hope in the midst of it all. I know this is a bit heavy for a blog post and like most people, I don’t admit to thinking about death as often as I actually do. Maybe I shouldn’t avoid that and maybe we should talk more about death outside of funerals and times of grieving. In any case, it’s times like these that I cannot help but think of the crucial role that faith in Jesus plays in my life. Tomorrow I have resolved to not live in paranoia of any lurking shadows of death. Tomorrow, I will try not to ignore the daily office prayers that my phone alerts me of. And tomorrow, I’ll aim to be more faithful with the opportunities I have with my family, friends and the strangers around me. In this last installment of Pentecost Sunday, I want to discuss this whole “speaking in tongues incident”. It’s probably one of my least favorite subjects because of all the baggage associated with it. Case in point is the scene in Bill Maher’s Religulous where televangelist, Robert Tilton, is babbling on for several minutes and then wraps it up by saying, “I love you” and flashes his Crest white smile. Regardless of how I feel about the rest of the movie, I laugh every time and then I want to cry when I realize he is connected to my faith. It’s not tongues, I know a few people who take the gift of tongues very seriously, they either have it, been used by it, have witnessed it, etc., they would not support that nonsense. That’s not the type of “tongues” Acts 2 is describing. On the day of Pentecost, the disciples were filled with the Holy Spirit and they spoke in different languages, ones they did not know. I tried to explain this to my Senior High Sunday School class a while back. For today’s audience, speaking in different languages isn’t that impressive, in fact, most people already know a few. Some local schools are teaching their students Spanish in third grade. And of course, there’s that adorable Dora. Yep, even cartoons are bilingual – not much of a miracle. While we can assume that many of our beloved disciples knew parts of several languages (Aramaic, Greek, Hebrew), what was incredible was that they were speaking languages that they did not know. And everyone knew that they should not know them, that’s why it created a scene. (This is why Luke goes through the trouble of mentioning all the different ethinicites that were gathered for the conclusion of Passover, the Feast of Weeks). Oh and all of them were speaking them at the same time. Oh, and one more thing, they started preaching that Jesus had risen from the dead and He was Lord. It is pretty incredible but for years, I admit, I sort of missed the point. Pardon my arrogance, but here’s another instance, where if I was God, I would have done things a bit differently. I would have sent the Spirit and made them do something really spectacular, like fly around Jerusalem or make the Temple disappear and then bring it back but some place else or empower them with super-human strength and round up all the Romans and crucify them and then give Peter a moment with Pilate, “You asked earlier what truth is? It’s … (some really, really cool line – in a different tongue!)”. You might make the mistake and think that I have quite the imagination but I’m really just repeating a variety of Mel Gibson movies. I know that’s ridiculous – that’s completely absurd (sigh). But why is it absurd? I mean a few pages back, Jesus walks on water, feeds the 5000, then 4000, heals some people, casts out some demons and raises a guy back to life, all before He is resurrected. Flying apostles would seem to fit right in. So again why not? I’ll try to keep this part short but it has a lot to do with motive. Jesus never performed this miracles to create publicity or cause a spectacle. It’s necessary to understand that the miracles are always done to serve people. (I know there’s a reformed brother/sister reading that just shouted at the screen “AND to bring glory to God.” I know, I know, but when everything gives glory to God, it seems the miracles had a more special role). And that’s an important aspect of Pentecost, the disciples are empowered by the Holy Spirit to preach the good news of the risen Jesus to the whole world. What better miracle then the one God performs? That’s the part I had been missing. This was a Gospel for all people of all nations and tribes and what better miracle than to have masses of people from all over the world to hear the message in their own language. Consistent with the idea of Incarnation (where God comes near), the Word comes near – through the disciples empowered by the Holy Spirit. What is among the many lessons in all of this? For me, it is when faithful believers allow the Spirit to fill them, the hope, truth, and love of Jesus is proclaimed. Yesterday was Pentecost Sunday and as mentioned in the previous post, it is an extremely important Sunday in the historical church. The day the Holy Spirit filled the disciples and fills believers still today (and is at work throughout all creation) is an essential matter of what Christ-followers should reflect on. I will be the first to say the Holy Spirit (and the theology of the Trinity) is a difficult doctrine to pin down. So years ago, I stopped “trying” because a theology that is living and breathing cannot be pinned down by mere mortals. Take note, this does not mean I have given up studying Scripture, theology and the world around me, I just no longer buy into the notion that aside from a few loose ends that will be corrected when I get to heaven, I can have it mostly figured out ;-). Having been educated in my college years in systematic theology (among many worthy disciplines), I had always been overwhelmed by the idea of trying to have perfect Biblical theology (a fruitless mission). That is part of the claim of modernity – that you can know it if you discover it all, accept it all, organize it all, understand it all, etc. The problem is “all” is too tricky for the flawed human mind and nature. As it turns out, one cannot comprehend it “all”. Feel free to try, you do not have to believe me but let me know when you stop trying, I think I have some solid brotherly direction for you. God is not a subject. “World religions” might be a class but God is a person. He is not empirical, cannot be researched, organized and reduced to be “more understandable”. In other places, I have described this as dissecting the theological frog. The Holy Scriptures is a sacred thing that we are invited to partake in, one that we read, study, meditate, apply, converse with others, all in a Christ-like humility. And one of my favorite aspects of all this is Paul writes that the Holy Spirit will help us understand God’s will/word. Passages like I Cor. 2:14 & most of Eph. 1 have allowed some theologians to explain that the Spirit will “illuminate” these things to us. (“Illuminate” huh? Sure sounds good, throw that in the mix too). The Holy Spirit helping us to understand, that sounds like what Jesus promised in John 14. (He actually calls the Spirit a “helper”. Further, I have always found this to be so interesting because there was no New Testament cannon, only Old Testament and it would take centuries before his very writings would be canonized. Certainly they kept them, read them, copied them, etc. but there was no 3 ring binder, marked, “New Testament” that they threw them into it. What was being illuminated was the Old Testament and the present world in light of the work of Christ. Sorry for the rabbit trail, I find that exciting). I sometimes wonder what the idea of “faith” would look like if it were not for the work of the Spirit. I suspect that the Church would be obsessed with knowledge than anything else and therefore, “faith”, would be a meaningless term. Which in looking at one of the most important aspects that I have underestimated in all the conversations about Scripture, accuracy, inspiration, the text, etc. is that the Spirit has always been at work in people’s hearts. The Spirit at work in our hearts is even more important than proper doctrine. Don’t misunderstand me, the Church has suffered greatly from anti-intelluctualism and doctrine is extremely important and as a whole, we may not be giving it its proper attention but loving God (and others – Mark 12) is even more important. Again, don’t misunderstand, people have claimed the Spirit’s working in places where He was not – this is sinful but not a reason to dismiss the Spirit entirely, as some have seemed to do. We need the Holy Spirit to realize, mature, and be at work in our faith and understanding of it all. And among other reasons, this is why Pentecost is so important. 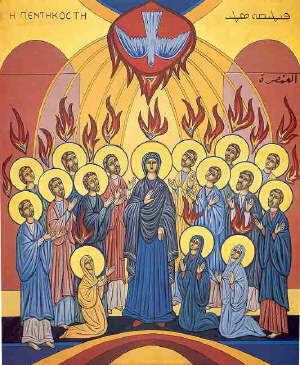 As many know, this Sunday is Pentecost Sunday. Pentecost means “fifty” and the historical Church celebrates this on the 50th day after Easter. It tends to be a bit neglected in non-liturgical churches but many pause and reflect on its great significance to the New Testament church – you should too. Earlier this week, I had an assignment for my last class at Biblical and it got me reminiscing on the idea of the call of pastoral ministry and my evolving understanding of it. For the sake of context, I wrote this on a normal day, not frustrated, not high on life, just a normal day. (I even edited on a normal day too). It is not an indication of my current mental state – just a reflection. If you are not already, I encourage you to journal and reflect too – it’s a great excercise. As every pastor knows, the ministry is a fairly complicated vocation. I used to believe that the if one knew the Scriptures, could speak well in public and was grounded in prayer then one could be a pastor. If they were a “really good” one, then he had relational skills, a sense of humor and a working knowledge of relevant things like world events and sports. If one were to be exceptional, then he was able to write, counsel, problem solve and had virtues like wisdom and patience. I feel that described the apostle Paul, only without the sense of humor. Looking back, my idea of the pastorate was fairly shallow back then and I fear in some ways, that it still may be. (For one, I am no longer only using the word “he” exclusively anymore to describe the pastorate ;-). If it were not for the last ten years of ministry, I am not sure I would ever have believed someone had they told me how difficult this career really was. From the outside looking in, it looks fairly manageable for anyone emotionally healthy and had adequate organizational skills. The most difficult part of the job seemed to come up with new material week and after week but surely that had to be rewarded by the constant praise the congregation would give in the forms of applause, compliments, gift cards, and various expressions of admiration! Man, was I surprised. I remember still being a junior in undergrad when a veteran senior pastor took me out for lunch and tried to talk me out of the entering the ministry. At least that is what it initially seemed like. Given my stubborn nature, we needed to go for a walk afterwards so he could continue the intervention. There was a part of me that resented him for saying all that he did, a small part that appreciated it in case he was right but the bigger part interpreted as a test or a rite of passage and I was determined to stand strong. After enduring the barrage and expressing my unshakable belief that I was called to be a pastor, he embraced me, told me he was proud, and prayed for me. It would probably take five years before I remembered this conversation had ever taken place. It’s interesting to me that since then I have had quite a few conversations with people considering going into vocational ministry. Frankly we need more pastors, especially when the older boomers begin to retire. In these conversations I try to lay out the challenges and the pains endured in ministry but I also try to express the fulfillment and the joy of it as well. Because to be honest, I thank God that He has allowed me this position. There are numerous directions one can take when discussing the hardships of ministry and I know I am certainly not the only one with a difficult job (There are a few things that make the ministry unique however but let us not get into that here ;-). From the time commitment, to the hectic schedules to the toll it takes on one’s family, it is a difficult life. Factor in the criticism, the constant power struggles and the insecurities that reveal themselves and one begins to see how taxing on the emotions this vocation can be. I used to think pastoring was preaching and teaching the Word, then later I added the term, ‘leadership’, now I see it as those and culture-making. The pastor must create a healthy culture of discipleship in his local church community in order to preach the Gospel in the Kingdom. Most of us know by now that the Sunday sermon is not enough and that the pastorate is much more than that these days. May God forgive us for the times we have been unfaithful to the calling because while it is complicated – It has always been about people. Part 2 some day. Day 3 at Q was a quick one. There were some presentations I was really looking forward to. They do not give a machine feelings that we have. But what if we could build a robot that was just like a human? And her time was up. Charles also gave an excellent presentation. Great ideas and he’s one of those people whose enthusiastic energy is not annoying but instead, contagious. You should check out his website Ideation and follow him on twitter. (And he loves the Yankees so you know he is a good person). The more time we spend with collaborators, implementation will finally take place. As much as you love ideas, you must love implementation. For some, their pride gets in the way of collaboration. Social media is powerful when it is social. – Crowd is smarter than one. if you openly share, the speed of which implementation takes place increase exponentially. Lee said more, and when I clean my notes and post them. Loved it though, inspired by it, hope to be altered by it. He is the author of biographes on William Wilberforce and now one on Deitrcich Bonhoeffer. NYC metro people will know him from Socrates in the City events he hosts. One coming in 2 weeks. Sadly, Eric was only given 9 minutes. Eric is absolutely brilliant and so fun to listen to. (He also presented when Q came to NYC. (Kinda weird, he was presenting when my wife Susan sent me the text saying, “Just spoke with birth mom – she wants us to adopt her baby!! !” I’ll never forget it, Mextas was presenting, Rebecah Lyons was sitting to my left, Chris Huertz was sitting behind me at my table (he doesn’t know who I am but he’s a bystander to the story) and there was a choir of angels that appeared and sang the Hallelujah chorus. I don’t think anyone remembers that but it’s my blog – that’s what I saw ;-) And yeah, all this came to mind again as Eric shared about Bonhoeffer. Eric asked, what does it look like to be a Christian today? God wants us to integrate. Antonio is a pastor/activist from Brazil. It was incredible to listen to Antonio. We hear so much of the growth of the church in the global south, it was sobering to hear the challenges they face. Another example of the church’s resilience when pushed to the brink. We have corrupt police and very violent criminals. What does it mean to be faithful to the Christian gospel in such a context marked by so much injustice and violence? Faith without works is dead – we need love. The fight for human life is a result of human love. In response they have used the power of images, utilized social media and have done so with integrity. They pursue matters of that deal with public safety. I had to leave after this presentation and missed one from Wayne Gordon – Renewing the City (he’s from Portland where Q will be next year) and one by Jon Tyson (church planter in NYC and all around good guy) – Advancing the Common Good. I hope to catch them online when they become available. First, I liked that Andy wrote it. I do not know him personally, just thought it was a worthy piece. Second, Andy refers to all these departures, sabbaticals, breaks as a “phenomenon” – you need to admit, it seems “something” is going on. Third, no one ought to judge the intentions of any of names mentioned. Fourth, I think it’s worth remembering that today’s conference speaker bears some similarity with the 19th century evangelist. And the tradition of the evangelists has not always been a bad thing if you can get past the idea of today’s “televangelist” whom Paul says “there is not one good, not one” (I will abuse context the way they do) Which leaves me wondering, when are some of those guys going to participate in this phenomenon and take a non-scandoulous break? Maybe the next day another presenter can begin with, “I apologize that I have come late to this event and that I will need to leave as soon as I am finished speaking but my schedule is a bit complicated at the moment. See, I have just accepted a position as the worship pastor at this new church. It’s my fourth pastorate in 7 years now, and we have a disabled child and a world of debt but I was asked to share about my experience in the ministry and so here’s what I can tell you …”. I think many of would be able to connect with something like that. While I do not think Chan or Belcher or anyone ever used the church as a “farm team”, it would seem a bit naive to assume that some leaders are not guilty of this, or at least trying to do this. And while i have always been suspicious on just how lucrative and fulfilling the speaking circuit is for the long term, I have always seen the presenter as a position of value. Of course I do, I chase down theologians and writers like I used to chase down baseball players to sign my Upper Deck cards. Sixth, I absolutely loved David Fitch’s post, “Do You Trust an Author on the Church Who Leaves His/Her Church?”. After I read it, I decided not to post this (then I read something else and I changed my mind). Also, there was also an excellent comment on this post by Nathaniel Snow (May 11, 10:24am) about the publishing industry and copyright being part of the empire (for those of you who appreciate that discussion). Rollins gets pardoned because he has more friends than Ashton Kutcher. And unlike Kutcher, he doesn’t care. Further, he’s not a pastor (read the tweets, he’s not a pastor! ;-) We are all crazy in love with Francis Chan so he is excused and I think everyone accepts that he wants to do something different – good for him. From where I sit, Belcher is the only one that no one has defended (I may not be following the right people). But it seems to me that some of have pretty much said, “Yeah, he wrote a best-selling book and is cashing out.” What’s wrong with him leaving the pastorate at this time? Ministering in the Kingdom is a life-long calling, but I am not sure the pastorate is and I do not write that as someone who hopes to get out. I don’t know Belcher, but listened to the audio version of Deep Church, liked a good bit of it, liked his voice and while I do not connect with some of what he concludes, I think he has done a great thing for us in the Kingdom, especially those of us who are in the middle of the emerging-traditional church discussion. Does that mean he “deserves” a break? No, he could have taken the break even if he had not written anything – it simply seems that he and his family need a break. It seems that there a few bloggers out there that are disappointed that the sales of his book have allowed him to take a break. You are envious and mean … and I hope your computer crashes (And if it did, I suggest you ask Belcher to buy you a new one ;-). For all we know he’s a powerball winner but in seriousness, good for him for writing something worthy buying. (After the free christianaudio.com download, I bought the book to support the “artist” – a virtue learned from my Napster days). But not only is it good for Belcher, good for the many of us who finally contributed to the success of a book that didn’t have these words in the title ‘Your Best’, ‘Personal Prosperity’, ‘Success’, or “Vote for Me and I Will Make All Your Dreams Come True!”. Seriously, it’s about time some of us bought something worthy from CBD. Now if he comes out with a book called, The Deeper Life, Examining a Third Way Beyond the Missional Life and the Celebrity Life” with devotional journal, Deep Meditative cd and his own edition of the Your Deep Life Now study Bible, then let the barrage begin. But to make this simple, and to offer a “third way” – as a proud pluralist, it’s easy for me to reconcile the way of JIm Belcher, the words of Andy Rowell and the life of David Fitch. And while I hope my career resembles more of Fitch. Assuming he is following the leading of the Holy Spirit, he is allowed to change his mind too. I think what we can gain from Rowell’s article is have we created an unhealthy speaker-writer culture that is unhealthy for our local churches? Regardless of recent departures and personalities, some reform is needed on who we give a mic and pen to. I cannot disclose how I got this. Nor have I been able to determine the authenticity of it but I am passing it along. I would like to begin by expressing my sincere gratitude of taking the time to read my books and lament my moving on as the bishop of Durham. Initially I was under the impression that you were a member of my congregation, but one of our secretaries told me you lived near Philadelphia, employed by PBU, a student of Biblical Seminary, and a dear friend of one of the younger inspirations speaking into my life, that wonderful Tim Ghali. That said, it is perplexing for me to see why you are taking this so hard. After reading your post, printing it out, and committing it to memory in one of my afternoon tea and walks, I now understand your pain. I too will miss the title of Bishop but you must know it is not all that it is made out to be. For one, they make you wear these ridiculous costumes every so often. It’s embarrassing really. Second, living in a castle seemed like a splendid idea after watching Braveheart. But honestly it’s very drafty in the winter and the mattresses are squaggey. Further, they wouldn’t let Maggie redecorate, we have saints buried in the living room, and I believe the ghost of Saint Peter is in one of those armored knight statues in the South Chamber hallway. I believe it’s Peter because he speaks in terrible Greek, curses frequently, denies it, reeks of tuna, and every so often, I receive a scribbled note that says, “You need to write a book called, “What Saint PETER Really Said”. But back to you my dear boy, Evan, I want to disclose a little more of what the press article did not say. Not only do I really want to finish my new Paul book, but I want to be more anti-establishment and becoming a professor is the next step. I hope when it is all said and done, I can be a youth pastor at some hip church plant in the Northeast and also open a teahouse called, “T For Everyone”. You get it right? You Americans are at times a bit slow. Oh and please stop sending me emails inquiring of internships. There are more of these requests than contestants of “Britain Has Got Talent”. As always, she is awesome. Some favorite lines – “Jesus tells us to fast – why? Because it makes us feel bad – lol. It’s only when I am confronted my citizenship that I can understand the Kingdom. There is a rhythm of life and fixed hour prayer is a way of hinging our day on the worship of God. She mentioned an iPhone app. I think it was this one. Of all the disciplines, she believed that fixed hour prayer is the most important. She quoted a rabbi that said, it’s the prayers you say, not the ones you don’t that God really cares about. (That actually does help in not turning into a guilt-ridden ritual). Of the disciplines, sabbath keeping and fixed hour prayer have been difficult for me. I found this convicting and helpful. we can do so with music, literature, but true transcendence a pilgrimage. Q must have got some feedback that asked for more spiritual formation. Are today’s believers meant to keep the Sabbath? I liked Matthew’s idea of 24-6 (as opposed to 24-7). Sabbath not saved by man. – We are not to save the Sabbath – The Sabbath is to save us. if you keep sabbath for life – you added 11 years with the Lord. We spent the last minute and change in silence (a tithe of the presentation to sabbath. Cool idea). I love the faith and science discussion. In addition to encouraging everyone to engage the sciences, he also encouraged to familiarize ourselves with the views and arguments that argued against faith (like Dawkins’ God Delusion and other new atheists). Lucky for me, I like these books (they strengthen your faith). Encourage – we need scientists to up their game. – They need support. Think of how we can support scientists from the church. A very powerful and emotional presentation. It’s nice to see that cutting edge thought is not just confined to stats and ideas. Sean revealed that he had been let go by Wal Mart for having an affair with his boss. Don’t eat the food (of the world) – Jesus said eat my flesh. H addressed his wife, – thanks for battling for me, thanks for banging on the gates of hell and demanding your husband back. Every morning I wake up, I wake up next to grace. I guess I walked away thinking, may God spare us from such an experience but it was beautiful to see the power of love and forgiveness. One of my favorite presentations of the event. Florida doesn’t believe we are in a recession but instead in need of a reset – a raw emotional reset. He looked at other time periods including just before the Industrial Revolution. He would argue that our creative energy is that makes us human and binds us together. We have created a new kind of economy that harnesses the human mind – that’s the easy part. We are moving into a new of post-materialism. We use to ask what you do for a living, now we ask where do you live? Being in a place that you love. – in community – Whose Your City? (example used was Jack White from Detroit, now living in Nashville but I didn’t want to stand up and correct Florida in front of everyone. I understood his point. But I had to chuckle now because of the irony of White living in Nashville. Or is it irony? There was a lot I liked about the end, because I see a strong connection with where we live and “Let your will be done on earth as it is in heaven”. As a new father, as a youth pastor, and as one who sees the state of fatherhood in crisis, I was really looking forward to this presentation. I really enjoyed the presentation but was hoping for a little more. I am sure Roland had plenty more to say but again, it’s tough because of the time restraint. I should google him and see what else he has. As adoptive parents, this is obviously something that is important to us. As I was listening, it dawned on me that although Susan and I had been asked numerous times about adoption, we do not know anyone who has adopted since we have two years ago. This caused me to think that perhaps I ought to do my part in creating more awareness to the need. The 7.0 earthquake in Haiti devastated millions of lives. Compassion-fatigued American’s have become over saturated. The natural questions ensue. Can Haiti change? Is there hope for Haiti’s most vulnerable children? Through the power of a documentary platform, the lives of two Haitian orphans are elevated and their stories told. CNN Correspondent Soledad O’Brien and Discover The Journey’s Jonathan Olinger open the world’s eyes to the complexities of caring for children in the midst of one of the greatest disasters the world has ever seen. Gabe – How do you handle all the suffering? Soledad – I cry a lot but I channel it through my vehicle. The documentary this past Saturday night but I was unable to watch it. I am trying to obtain a copy or if it’s online somewhere. Seems worth watching. I’ll post separately on Conversations on Being a Heretic. It was Scot McKnight interviewing Brian McLaren. It was great, too short, and grateful that both are brothers of mine in the Lord.